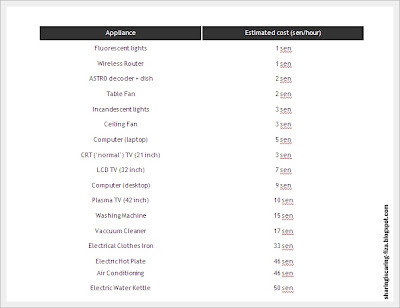 Do you know what contributes to your monthly electricity bill? For those in Semenanjung Malaysia , TNB’s tariff is approximately 30 sen to 45 sen per kilowatt-hour (kWh), depending on your usage. The more you use, the more expensive the rates! alamak sedar tak sedar mahal juga yerr.. kene berjimat skit lepas ni..
selalu on 24hrs thermo pot. bagusnye info ni. lepas ni kena hati-hati. tQ. ZARIN: Tu lah, i pon pakai electrin kettle.